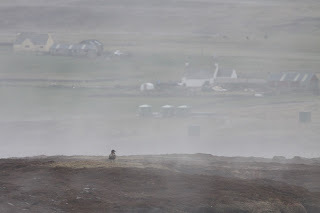 Fair Isle Bird Observatory: the Warden's diary: Migrant time - on the Dot. 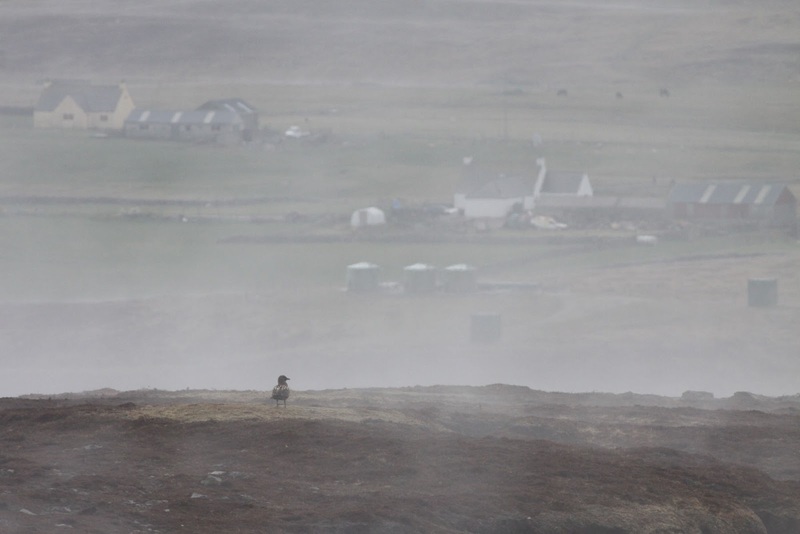 A Bonxie looks over a misty Fair Isle on 11th, generally the weather has been pleasant of late, with lightish easterly winds and sunshine, although this evening heavy rain has set in and strong SW winds are forecast for tomorrow. 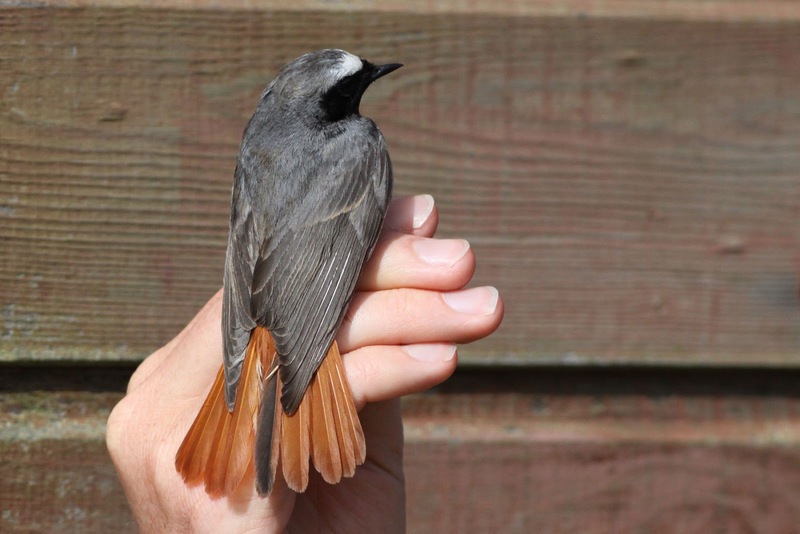 Promising conditions continued, with a steady arrival of new birds, a small fall on 11th and a good selection of scarce migrants today. 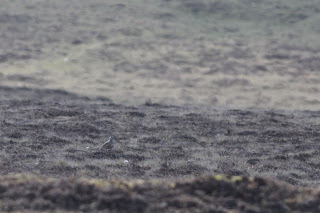 Bird of the day for me today was the Dotterel on Vaasetter, after missing five previous birds on Fair Isle, it was great to finally get it on my island list. After missing my first Dotterel on Fair Isle around 7 years ago, it was quite a thrill to scan across Vaasetter today and find this beauty! 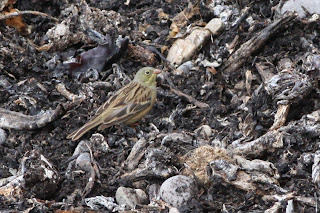 Perhaps even better was the male Ortolan on the beach at South Harbour, always good to see as it has not been guaranteed as an annual visitor to Fair Isle in recent years and this was an especially smart bird. One of my favourite birds, this Ortolan was one of several migrants feeding on the seaweed in South Harbour (it was joined by a Wryneck later, with Pied and Spotted Flycatcher also present). 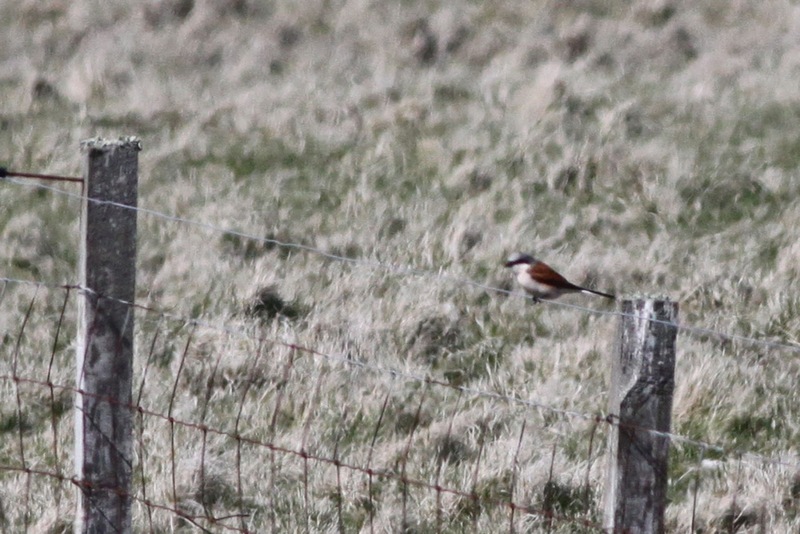 The compliment of scarcities was added to by a female or first-summer male Red-breasted Flycatcher in North Haven (along with a Wood Warbler), a male Red-backed Shrike at Chalet, a Wryneck at South Harbour (presumably the bird from Utra yesterday) and an Osprey that made a couple of passes over the island. The cliffs around North Haven held several migrants today, including this Red-breasted Flycatcher - only the second spring record in the last four years. 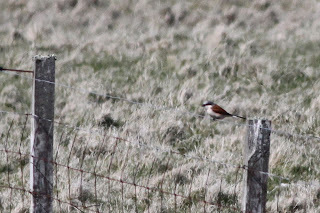 Two Red-backed Shrikes have been seen this week. 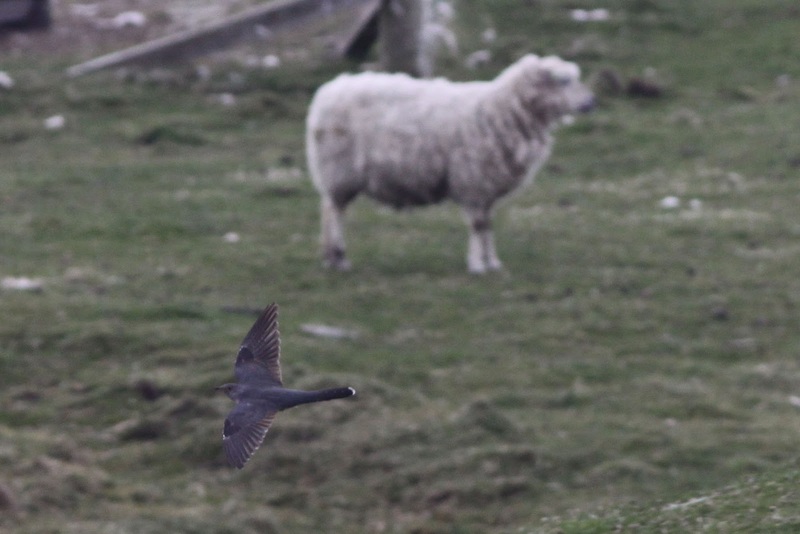 Strangely, apart from the above list, there were actually not that many new birds today, with Sparrowhawk and Pink-footed Goose amongst the few other new species to arrive, whilst Short-eared Owls increased to three. 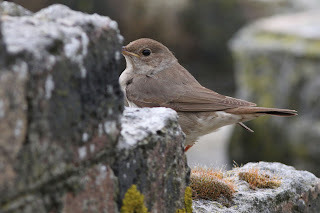 Other highlights during the last few days included the Thrush Nightingale lingering until the 10th, female Red-backed Shrike around Stackhoull (9th-11th), Wood Sandpiper at Da Water (11th), Hawfinch touring the gardens in the south (10th), Cuckoo at Setter (10th), Long-eared Owl (9th-11th) and the Grey-headed(-type) Wagtail at South Harbour until 10th. The Thrush Nightingale showed well at times, but was often elusive - here it manages to do a bit of both. 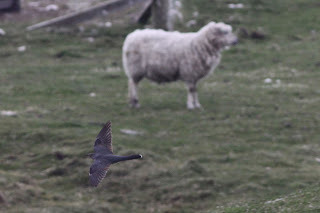 After just one record last year (the worst year for the species in FIBO's history), it was good to see the first Cuckoo of the year this week, even better was when it was trapped in the Vaadal later. 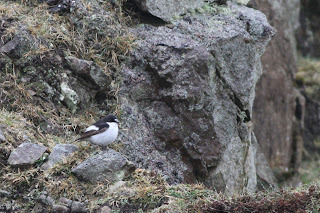 This flava Wagtail lingered for several days in South Harbour. Although presumably a Grey-headed Wagtail, the supercilium is rather prominent, perhaps suggesting the influence of another subspecies somewhere in its genes. The best day for common migrants was yesterday when totals included: 8 Chiffchaff, 17 Willow Warbler, 5 Blackcap, 8 Lesser Whitethroat, 6 Whitethroat, Grasshopper Warbler, 3 Sedge Warbler, 5 Ring Ouzel, 6 Redstart, 4 Whinchat, 16 Pied Flycatcher, 21 Tree Pipit, 4 Common Sandpiper and 7 Knot. A good spring count of Pied Flycatchers (the highest since 2009) was mostly made up of smart males. 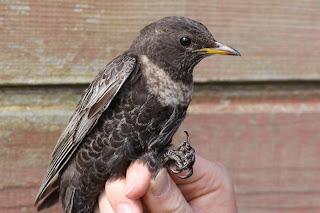 ... and this Ring Ouzel (on the same trap round). The breeding season remains slow for the seabirds, although the first Razorbill egg was seen today. 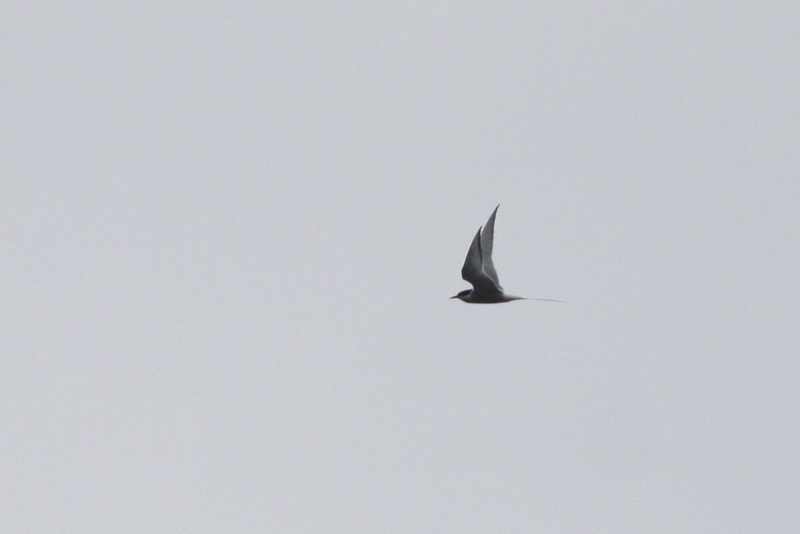 Arctic Skuas still number only around ten, whilst Arctic Terns have built up to 15 today after the first was seen on 8th. The best breeding news though is the return of the nesting Peregrines, with a nest on the west cliffs containing at least two chicks. 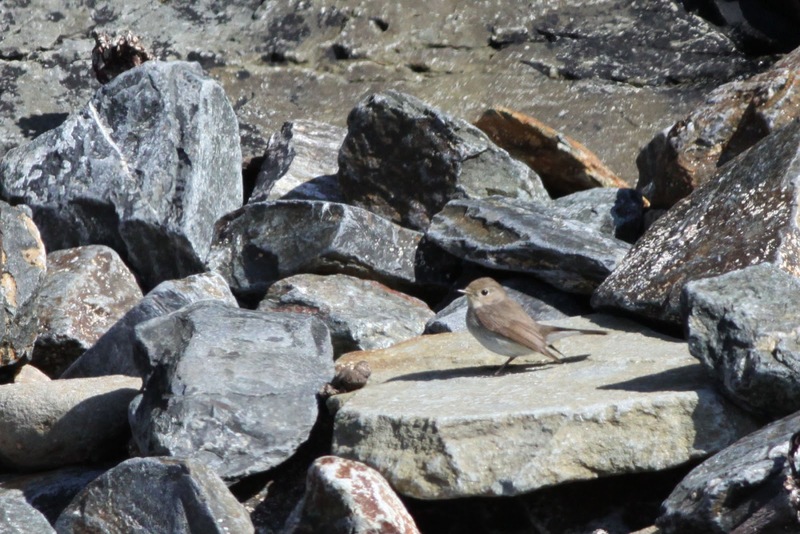 Tirricks are back, but how will the breeding season for these and other seabirds turn out this year? Sounds brilliant up there atm, you must all be having a great time! 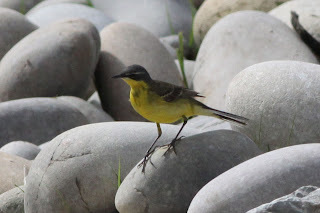 Daily Yellow-nosed Albatrosses and Wilson's Petrels just dont cut it; I want to see HYBRID YELLOW WAGTAILS! And ring a Cuckoo... (Perhaps 4 weeks in the Indian Ocean is finally getting to me...) See you on FI later in the year I hope. Only if you bring an albatross!